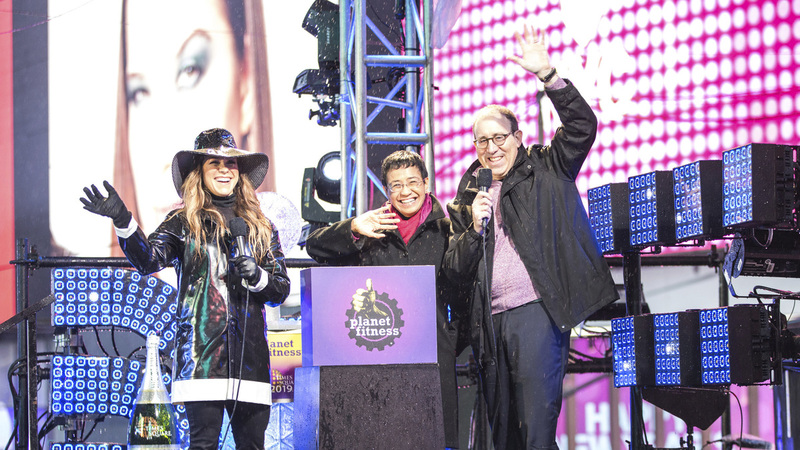 Maria Ressa, center, stands on stage at a 2018 New Year's Eve celebration in New York's Times Square. Ressa, the head of a news site in the Philippines, was arrested on Wednesday in Manila. Award-winning journalist Maria Ressa was arrested on Wednesday at the headquarters of Rappler, the news outlet she runs in the Philippines, the latest in a deluge of legal attacks on the journalist by President Rodrigo Duterte's government. Ressa, 55, is a former CNN bureau chief. She was among four journalists, including the murdered Saudi columnist Jamal Khashoggi, named by Time magazineas Person of the Year for 2018. Since starting Rappler in 2012, Ressa has not been afraid to cast criticism on the government as a result of the news website's investigations into impunity and corruption. Plainclothes officers from the National Bureau of Investigation, an agency within the Department of Justice, arrived at Rappler's offices in Manila around 5 p.m. local time. As law enforcement served the warrant, staff were told to stop taking photos and videos. "We'll go after you too," an officer told reporters, according to Rappler. Ressa was charged with cyber libel by the Philippine's Department of Justice. "These legal acrobatics show how far the government will go to silence journalists, including the pettiness of forcing me to spend the night in jail," Ressa said in a statement. The charge traces back to a story published in May 2012, months before the country's cyber crime prevention law was approved in September. Years after the article came out, a businessman named Wilfredo Keng complained that the report linked him to human trafficking and drug smuggling. He said that because Rappler updated its article in 2014, it fell into the purview of the law. On Wednesday, presiding Judge Rainelda Estacio-Montesa denied bail to Ressa. Ressa's arrest does not indicate suppression of the press, presidential spokesman Salvador Panelo told local media. It "has nothing to do with freedom of expression or freedom of the press," he said, adding, "I think I'd rather advise Maria Ressa just focus on her defense." Since Ressa launched Rappler with other high profile journalists about seven years ago, it has become known for its thorough investigations on the extrajudicial killings in Duterte's war on drugs. Amid a crackdown on media, the president has repeatedly targeted Rappler, accusing the outlet of producing "fake news." Gemma Mendoza, head of Rappler's research and strategy, said the site's comment boards and reporters' social media accounts are bombarded by accusations of being "presstitutes." Reporter Pia Ranada was harassed and banned from covering the president's palace. Multimedia Head Lilibeth Frondoso was imprisoned with her newborn child. Managing editor Glenda Gloria found a black funeral wreath on her doorstep. And in December, Ressa was arrested on charges of tax violations. She had just flown back to the Philippines after receiving prestigious journalism awards in the United States. The Committee to Project Journalists described Ressa's latest arrest as "legal harassment" that has reached a critical juncture. "We call on Filipino authorities to immediately release Ressa, drop this spurious cyber libel charge, and cease and desist this campaign of intimidation aimed at silencing Rappler," Senior Southeast Asia Representative Shawn Crispin said in a statement. Asia Program Coordinator Steven Butler tells NPR that Rappler has been spending a large sum every month to pay for lawyers to fight the lawsuits. "Like any digital media outlet, it's not highly profitable," he says. "So when you slap on these lawsuits, you just bleed them." He says the CPJ and the Omidyar Network have set up a legal defense fund with a target of half a million dollars which will be available to Rappler. Ressa's arrest also threatens to increase self-censorship in the Philippines, Butler says. "This marks a no-go area for the rest of the media on stories that are highly critical or embarrassing to the government." After Ressa was taken into custody, a rally formed outside of the National Bureau of Investigation. People chanted "defend press freedom" and "free Maria Ressa."